When I wander through Amsterdam, I tend to stick to the canals as my main routes, so when I end up wandering more side streets, I realize there are also plenty of charming scenes to be seen there, too. I spotted this cute bicycle with a fabulously large wicker basket near Amsterdam’s most central park, Vondelpark. I love how the shutters add to the scene, making it unmistakably the Netherlands. Place des Vosges is one of Paris most beautiful squares by far. Last year it was part of my running and walking path, so I was able to see it in the quiet of the morning when few people where there. I’m not sure I ever had those quiet mornings with my proper camera in tow, but I always was drawn to shoot a few here and there with my phone camera. When I visited Place des Vosges this Spring, I have to say I was a bit disappointed there was so little color when the rest of Paris is bursting with color and fresh blooming flowers. Still, the lush green and the beautiful lines of the façades make for beautiful images that are a good reminder of me to return here for more quiet moments. Many thanks to the Dutch students who had just parked all these pretty bikes before they paused in the Place for their picnic. So cool to read this account of biking through beautiful Paris! Ahh, Paris. Gorgeous, amazing, one-of-a-kind, and yet.. overdone. Doesn’t everybody have a Top 10 Things to Do in Paris (with Kids) list? I can’t bring myself to write anything so run-of-the-mill for you. But, even if I could, the entire post would be a big, fat, whopping lie because we likely did not do 8 of the 10 things on our trip. Instead, let’s focus on a few more relaxed, out of the way, low-key, winter-appropriate Parisian experiences. I’ll still dish on the good, the bad, and the beautiful… I just won’t wrap it all up put a “Top 10” bow on it. 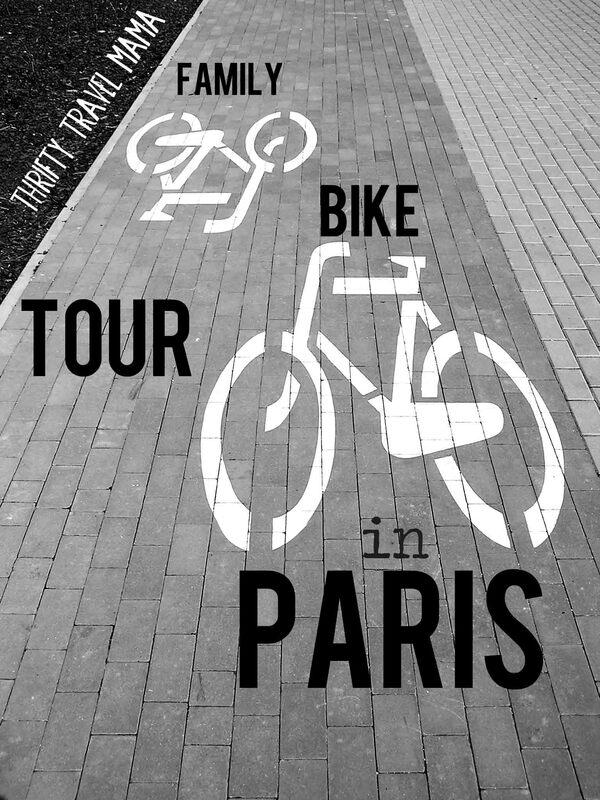 Bouncing Around Paris – on a Bike! Given our family’s love of the outdoors and the smashing success of our day out in Lucca last summer, I was determined to find a way to incorporate seeing Paris by bicycle. My obsession with bicycles never really subsides, although when I’m in Paris I see so many fewer bikes that I end up appreciating a perfectly posed one even more. While there are, of course, bicycles all over Paris, the owners don’t seem to go for the really adorable ones that I swoon for. You know, the ones with colors, that are personalized with stickers or a name, or perhaps with a wicker basket that is to die for… Anyway, I happened upon this one in the Marais one Spring day a couple of years ago. Something about this scene is just so perfectly representative of the 3rd arrondissement.